Commercial fishermen have a far more relaxed approach to fishing hooks than the sport fisher. They are making simple choices and it work for them. Commercial fishermen do not use expensive fishing hooks. Many fisheries change the hooks daily – only fishing once with a hook. Commercial hooks are priced at a third of a quality hook – but they fish the same first 3-5 soakings. After that, the commercial hook will corrode, at a speed of 3-4 times faster than a quality hook. 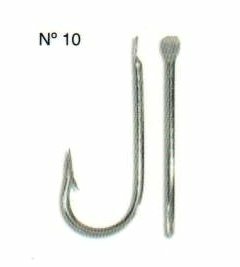 Carbon steel hooks comes in two versions, single dipped (cheap) and double dipped (such as Mustad) Carbon steel is stronger than Stainless steel, small and thin hooks of Stainless Steel will be too weak. A commercial and cheap fishing hook is 3-4 times more expensive, the hook have the same penetration performance in the barb the first 3-5 times of fishing. The fact is that also the expensive hooks lose its sharpness long before it start to corrode. For commercial longline, expensive hooks do not pay. The main manufacturers of all types of hooks have developed the right flexibility so the strength and flexibility is not a big issue when choosing hooks. 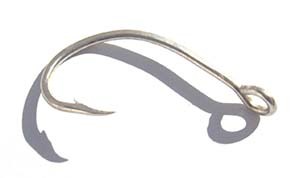 A straight hook will go down to the belly of the fish, and a twisted hook will catch the side of the mouth. 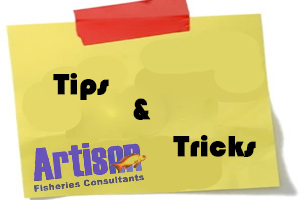 Therefore, straight hooks should be employed for fish with weak mouths since a twisted hook would easier be ripped out of the mouth. In long lining, a fish can be alive on the hook for the entire time of the set, as contrary to the single line fishing where the fish is brought on board within minutes.